The continue statement is used inside loops. 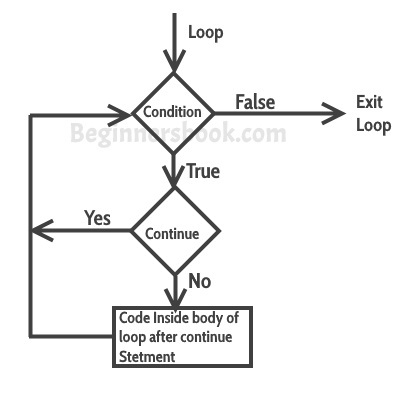 When a continue statement is encountered inside a loop, control jumps to the beginning of the loop for next iteration, skipping the execution of statements inside the body of loop for the current iteration. * the value of j is equal to 4. * this statement would be skipped. Value 4 is missing in the output, why? When the value of variable j is 4, the program encountered a continue statement, which makes the control to jump at the beginning of the for loop for next iteration, skipping the statements for current iteration (that’s the reason printf didn’t execute when j is equal to 4). In this example we are using continue inside while loop. When using while or do-while loop you need to place an increment or decrement statement just above the continue so that the counter value is changed for the next iteration. For example, if we do not place counter– statement in the body of “if” then the value of counter would remain 7 indefinitely. The print statement is skipped when counter value was 7.